Chairs are much more than just chairs, according to Italian furniture designer Martino Gamper. 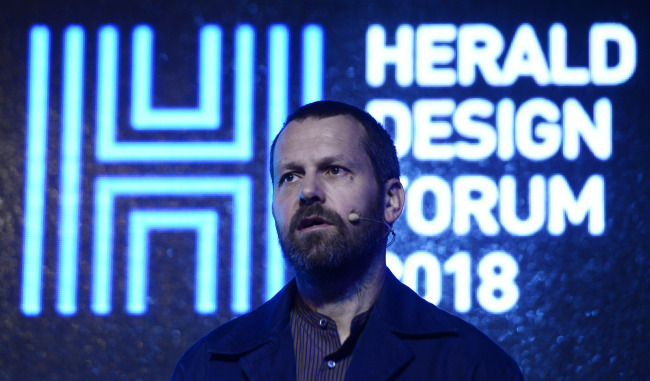 “I think chairs tell a lot about us, how we live and how we make things,” said Gamper in his lecture titled “Not Just a Chair” on Friday at Herald Design Forum. He suggested that there is more to the chairs that we normally sit on every day. Gamper also introduced his past projects and highlighted the history of chair making. He talked about Michael Thonet chairs, which the Conran Shop asked him to reinvent, and his visit to the Mundus factory in Croatia, which had been supplying the Thonet chairs for many years. Gamper also introduced “100 Chairs, 100 Days and its 100 ways” -- his internationally acclaimed project comprising 100 chairs made by combining and reassembling broken and abandoned chairs. A traveling exhibition of Gamper’s noncommercial chairs was shown in Germany, Tokyo and San Francisco, and opens this month in Melbourne. Gamper gave an example of the site-specific project “Arnold Circus Stool” -- a set of colorful chairs designed for cultural events held at locations imbued with history -- to show how design can bring new life to objects that are very specific to the place where they will be used. “There is no perfect human being and neither a perfect chair to go with it,” Gamper said, emphasizing that there are ways to look at furniture other than their commercial purpose. He insisted that there are diverse individuals, environments and circumstances that deserve more specific designs. “I think we have to have dreams and vision to make new things, poetic and meaningful objects,” Gamper said in response to a question about sources of his inspiration. He noted that history can also be a useful source, in reference to a speech made by Princess Dana of Jordan, who spoke earlier at the forum. The furniture designer added that careful observations could help to find new aspects of certain objects.